Sterilization is a procedure that prevents pregnancy permanently. For a woman, the procedure is called "tubal ligation" or "having your tubes tied." For this procedure, a doctor seals the tubes that carry eggs from the ovaries to the uterus. These tubes are called the fallopian tubes. What is sterilization for women? Sterilization is a procedure that prevents pregnancy permanently. For a woman, the procedure is called “tubal ligation” or “having your tubes tied.” For this procedure, a doctor seals the tubes that carry eggs from the ovaries to the uterus. These tubes are called the fallopian tubes. How is sterilization for women done? Sterilization for women involves surgery. It is usually done in a hospital but sometimes in a doctor’s office. Laparoscopic sterilization – For this procedure, you will get medicines through a thin tube that goes into a vein, called an “IV.” You also might breathe gases through a mask to make you unconscious. This is called “general anesthesia.” The doctor will then insert a tiny camera and tools through small incisions (cuts) in your lower belly. Next the doctor will use rings or clips to close your fallopian tubes. Or the doctor might use heat to seal the tubes shut. Most women are back to normal after 1 to 2 weeks. Postpartum (done after giving birth) sterilization – If you have your baby through an incision in your belly (called a “c-section”), the doctor can do the sterilization procedure right afterward, through the same incision. Getting sterilized after giving birth doesn’t keep you in the hospital for extra time. This is true if you have either a vaginal delivery or a c-section. Hysteroscopic sterilization – For this procedure, the doctor will inject a pain-blocking medicine near your cervix. He or she will also give you pain-relieving pills. You might also get medicine to help you relax and feel sleepy. 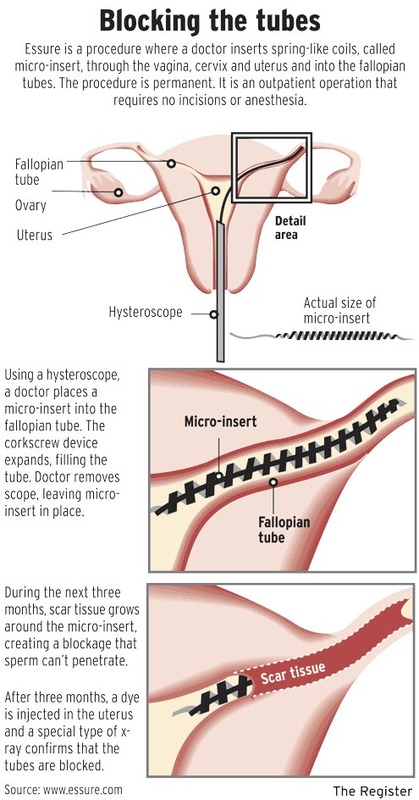 Then the doctor will insert a tool through your cervix and uterus and use it to place a tiny metal coil (brand name: Essure) inside each of your fallopian tubes. This procedure involves no cuts and is less painful and has a shorter recovery time compared with the other 2 procedures. You must use another form of birth control for 3 months after this procedure. At that time, you will return to the doctor for an X-ray to make sure both of your fallopian tubes are blocked. After hysteroscopic sterilization, some women have problems. These can include changes in their monthly period, pain in the lower belly, or allergic reactions to the metal in the coil. If you have had any of these problems in the past, talk to your doctor or nurse about them before having a hysteroscopic sterilization. How well does sterilization for women work? Sterilization for women is very effective. Less than 1 percent of women who have one of these procedures get pregnant. What are the benefits and downsides sterilization for women? The main benefit of sterilization is that it is permanent (IT IS NOT REVERSIBLE) and doesn’t require further medicines or procedures to prevent pregnancy. The downside is that women sometimes change their mind and regret getting sterilized. Women who do get pregnant after sterilization have a high risk of an “ectopic” pregnancy. When this happens, a woman’s egg joins with a man’s sperm to form an embryo. But instead of attaching to the lining of the uterus, the embryo attaches to a place in the body where it should not attach and starts to grow. This can be dangerous. If you have had a sterilization procedure and think you are pregnant, call your doctor right away. Please call us to schedule your sterilization consultation in Brooklyn NY or fill out the form below.